Abu Jassim’s story originally appeared on Holding On. This story has been reposted with permission. 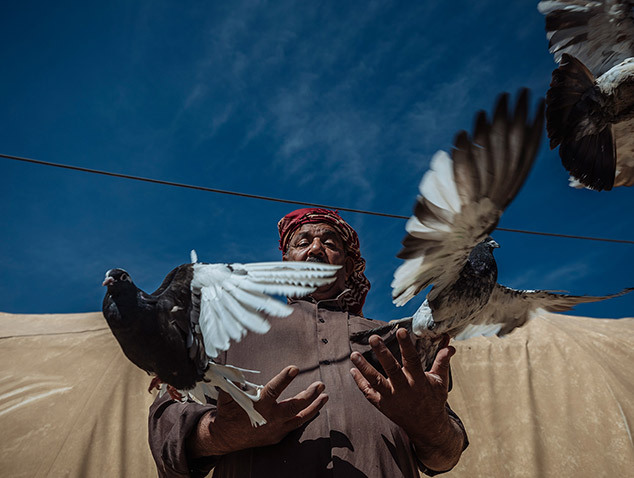 As heavily armed ISIL fighters poured into their village in 2014, Abu Jassim and his family had enough time to grab their identity cards, their pigeons and flee. The 49-year-old father of three had farmed the lands around Yathreb, a governorate 90km north of Baghdad, all his life. Nothing prepared him or his neighbours for a life removed from all that was familiar. The family had hoped their displacement would only be temporary, but days became weeks as they travelled from one place to the next until, three months later, they finally found sanctuary in Ahsty camp, Sulaimaniyah. And through all the hardships his family faced on the road, Abu Jassim managed to keep his birds alive, a comforting reminder of home before they took flight. The camp located outside town is adequate. It’s quiet, provides some basic amenities like modest schools for the children and has sufficient water, but the residents live in tents with little to do but relive the the trauma of their forced movement and the memories of the lives they left behind. Despite having his beloved pigeons with him, camp life feels like a prison for a family used to living on a vast, open plain. But, Abu Jassim still prefers the safety here to returning to Yathreb where his house was razed and security remains an issue. “Even if we returned, I would have to start from scratch. I don’t know when I will be able to rebuild my life, build a new house, buy a car, and get new livestock,” he says. He has managed to create a tiny coop outside the tent for his growing brood. “My pigeons have had squabs since then, and I now have over 40! I often just sit here in my tent and watch my birds through this little window,” he says.